Sunita Meena is the President (Sarpanch) of Aakodiya Block, Chaksu District, Jaipur. We met Sunita with her ward members in the village meeting hall. Next door was a creche – set up for around 10-15 of the poorest children in the village. When we asked her what made her happy, she spoke about the previous week where she’d successfully re-enrolled 8 girls, aged 8-12, in the local school. They had been taken out of school by their parents, who saw value in having the girls help with farm labour and cattle herding, rather than sending them to school. 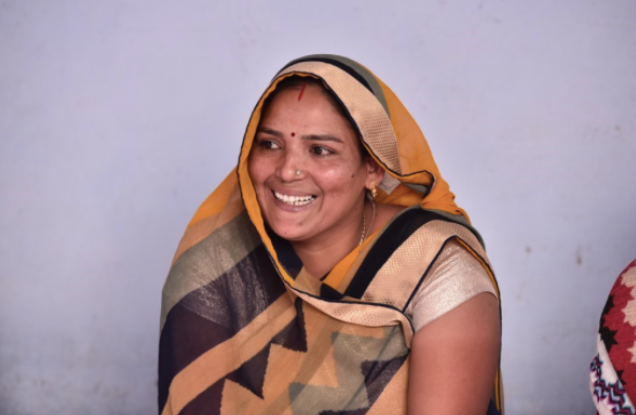 Sunita and her ward members negotiated with the families, impressing upon them the benefits of the girls receiving an education, while working out how the manual labour could be covered by those in the community. One of the things Sunita is most proud of is that she had a water tank constructed to provide clean water to 4 villages. The tank now benefits around 5,000 people. Before it was installed, the villagers were reliant on a hand pump that was not only difficult to access but also had water contaminated with fluoride (stunting the children’s growth). It took her two years of negotiations with the local government, but she never lost sight of her vision to provide her community with clean water. She travelled to the office personally on 15 occasions (a 20km round trip) and made numerous phone calls to ensure that the needs of her community weren’t getting lost in the bureaucracy.